, a dramatic poet and satirist of queen Elizabeth’s reign, was born at the sea-port town of Leostoff, in Suffolk, probably about 1564, and was descended from a family whose residence was in Hertfordshire. He received his education at St. John’s college, Cambridge, where he took the degree of B. A. 1585. 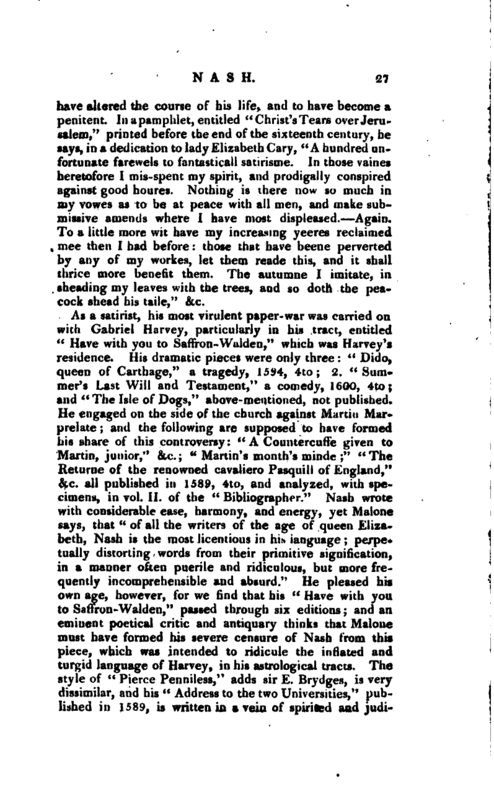 If we may judge from his pamphlet, entitled “Pierce Penniless,” which, though written with a considerable spirit, seems to breathe the sentiments of a man in the height of despair and rage against the world, it appears probable that he had met with many disappointments and much distress, which, from the character of his companion Robert Greene (see Greene), it is most likely arose from his own indiscretions; his “Pierce Penniless” might be no less a picture of himself, than the recantation pieces we have noticed in our account of Greene. It appears from a very scarce pamphlet, entitled “The Trimming of Tho. 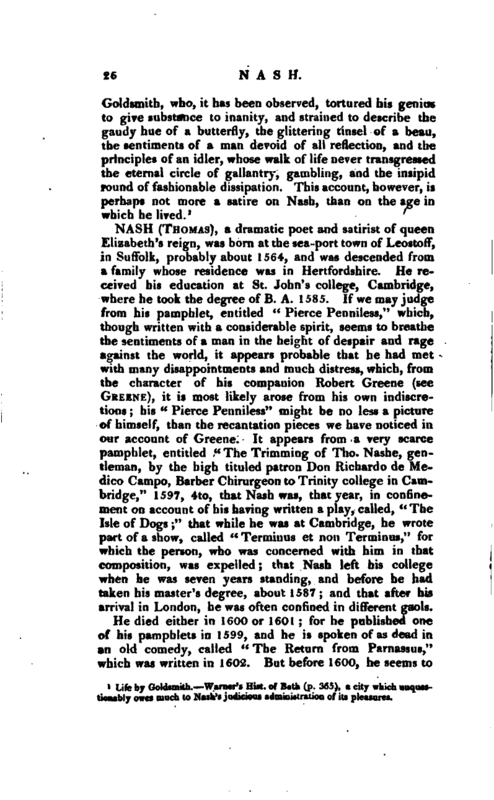 Nashe, gentleman, by the high tituled patron Don Richardo de Medico Campo, Barber Chirurgeon to Trinity college in Cambridge,” 1597, 4to, that Nash was, that year, in confinement on account of his having written a play, called, “The Isle of Dogs;” that while he was at Cambridge, he wrote part of a show, called “Terminus et noji Terminus,” for which the person, who was concerned with him in that composition, was expelled; that Nash left his college when he was seven years standing, and before he had taken his master’s degree, about 1587; and that after his arrival in London, he was often confined in different gaols. He died either in 1600 or 1601; for he published one of his pamphlets in 1599, and he is spoken of as dead in an old comedy, called “The Return from Parnassus,” which was written in 1602. But before 1600, he seems to | have altered the course of his life, and to have become a penitent. In a pamphlet, entitled “Christ’s Tears over Jerusalem,” printed before the end of the sixteenth century, he says, in a dedication to lady Elizabeth Gary, “A hundred unfortunate farewels to fantasticall satirisme. In those vaines heretofore I mis-spent my spirit, and prodigally conspired against good houres. Nothing is there now so much in my vowes as to be at peace with all men, and make submissive amends where I have most displeased. Again. To a little more wit have my increasing yeeres reclaimed mee then I had before: those that have beene perverted by any of my workes, let them reade this, and it shall thrice more benefit them. The autumne I imitate, in sheading my leaves with the trees, and so doth the peacock shead his taile,” &c.
As a satirist, his most virulent paper-war was carried on with Gabriel Harvey, particularly in his tract, entitled “Have with you to Saffron-Walden,” which was Harvey’s* residence. His dramatic pieces were only three “Dido, queen of Carthage,” a tragedy, 1594, 4to 2. “Summer’s Last Will and Testament,” a comedy, 1600, 4to and “The Isle of Dogs,” above-mentioned, not published. He engaged on the side of the church against Martin Marprelate; and the following are supposed to have formed his share of this controversy: “A Countercuffe given to Martin, junior,” &c.; “Martin’s month’s minde” “The Returne of the renowned cavaliero Pasquill of England,” &c. all published in 1589, 4to, and analyzed, with specimens, in vol. II. 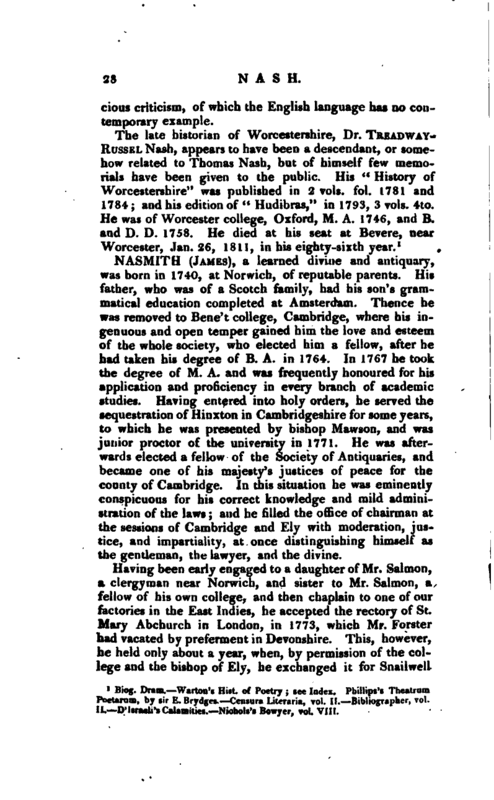 of the “Bibliographer.” Nash wrote with considerable ease, harmony, and energy, yet Ma lone says, that “of all the writers of the age of queen Elizabeth, Nash is the most licentious in his language; perpetually distorting words from their primitive signification, in a manner often puerile and ridiculous, but more frequently incomprehensible and absurd.” He pleased his own age, however, for we find that his “Have with you to Saffron-Walden,” passed through six editions; and an eminent poetical critic and antiquary thinks that Malone must have formed his severe censure of Nash from this piece, which was intended to ridicule the inflated and turgid language of Harvey, in his astrological tracts. The style of “Pierce Penniless,” adds sir E. Brydges, is very dissimilar, and his “Address to the two Universities,” published in 1589, is written in a vein of spirited and | judicious criticism, of which the English language has no contemporary example. Biog. Dram.—Warton’s Hist, of Poetry; see Index. Phillips’s Theatrum Poetarum, by sir E. Brydges.—Censura Literaria, vol. II.—Bibliographer, vol. II.—D’Israeli’s Calamities.—Nichols’s Bowyer, vol. VIII.